ScrapShala is a Varanasi-based start-up that upcycles everything from discarded wood, liquor bottles and scrap fabric to flat tyres and even cassette holders. The best part? They can even transform your old saris and distressed furniture into something beautiful (if you ship it over to them). Started in 2016 by Shikha Shah, ScrapShala’s main aim is to move towards a zero-waste lifestyle. In this mission, they’ve re-purposed more than 12,000–13,000 kgs of non-biodegradable waste into stunning decor and utility items. With a team of 15 artisans and a few interns, Shikha’s venture offers handmade products that are at least 50% scrap. We’re loving their Weekend Asana key holder (on Flipkart) that gives us the feels, and ikat-obsessed folks (like us) would want to order ScarpShala's key holder (made with discarded forks) right away. Also, who knew cassette cases could make for such pretty visiting card holders? They’ve got plastic bottle planters in bright colours, tyre stools and their tin luggage case is one of our favourites. 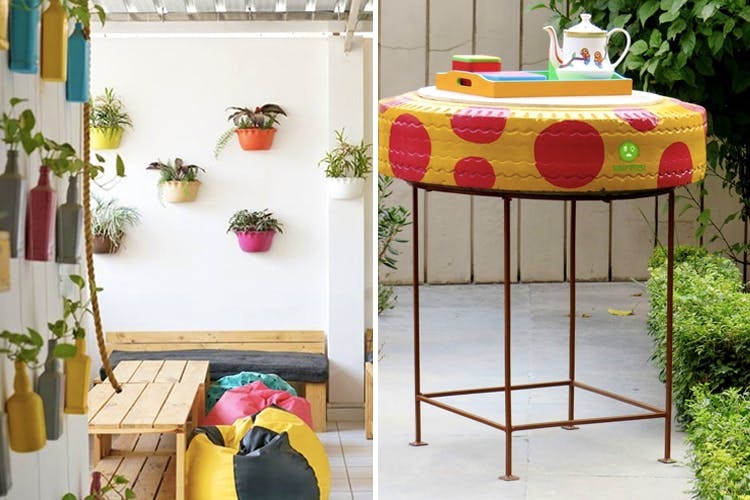 Recently, ScrapShala has also taken up numerous projects of redecorating cafes, providing vertical gardening services and they can even re-purpose your old saris and chests (that are too personal to be thrown away) into something beautiful. However, you’ll have to ship your items across to Varanasi, and they’ll send it back looking all pretty and nice. ScrapShala retails through Flipkart, Kraftly, Ecobuzz and Culture Truck, and they also deliver across India. For more info, check out their website.Price: Starting at INR 200 (key-holders).